This course is accredited by the Royal Society of Biology for 2019 entry. Kingston University graduates from this programme will receive one year's free associate membership of the Royal Society of Biology. Our innovative degree programme investigates the molecular processes that control life, along with providing insight into when these processes do not work properly and cause disease. You will explore how biochemistry can solve some of the biggest health challenges we face today such as antimicrobial resistance and the development of new cancer drugs. This course makes use of our new life sciences and chemistry laboratories, recently opened as part of a £6.8 million investment project. Fitted with the latest equipment for biochemical research our facilities give you extensive practical laboratory experience. Our biochemistry degree scored 90.5 per cent for student satisfaction in the 2017 National Student Survey (NSS). Year 1 provides you with a firm foundation in the biological and chemical principles on which life is based. You will gain a comprehensive overview of biochemistry, from the atomic level to that of the whole body. Subject areas include the fundamentals of chemistry, cells and tissues, genetics and molecular biology. A scientific and practical skills module will also introduce you to important laboratory techniques and the necessary mathematics, statistics and IT required by biochemists. Year 2 introduces some of the more specialised aspects of biochemistry. You will gain a detailed knowledge of protein function, structure and analysis; the major metabolic pathways; organisation and physiology of cells including cell signalling; genes and their expression; pharmacological principles; and the application of research methods. You will also explore a range of bioanalytical techniques employed in the pharmaceutical industry. Year 3 has specialist modules in Current Concepts in Biomolecular Science and Molecular Genetics & Bioinformatics, with a choice between Advanced Analytical Science and Clinical Chemistry & Haematology. You will undertake an independent research project providing an opportunity to research a topic of your choice within your specialism as either a laboratory, data project or a systematic review. Please note that this is an indicative list of modules and is not intended as a definitive list as these could change before your year of entry. This module is a core module taken by students in the fields of Biochemistry, Biological Sciences, Biomedical Science, Forensic Biology, Forensic Science, Medical Biochemistry and Pharmacology. The module introduces students to basic cell biology of prokaryotes and eukaryotes, molecular, organismal and population genetics, germ layers and basic tissue types in the human body, and a variety of microorganisms. Core factual material is provided in keynote lectures and supported via material available via StudySpace. Laboratory practicals give students the opportunity to learn selected current techniques used to study cells, tissues, chromosomes and microbial organisms. The module provides an essential introduction to modules at levels 5 and 6 that develop further knowledge in cell biology, anatomy, physiology, genetics and microbiology. This is a core module taken by students studying Biochemistry, Biological Sciences, Biomedical Science, Forensic Biology, Forensic Science, Medical Biochemistry, Nutrition and Pharmacology. The module is intended to give you an understanding of how basic chemical elements are bonded to form complex biomolecules in living systems. The module will then elaborate on the role that structure of proteins, carbohydrates and lipids plays in defining their properties and function along with describing some of the laboratory techniques used in their investigation. The module will also introduce the importance of energy transformations in living organisms. The module provides an essential introduction to level 5 and 6 modules that develop further knowledge in biochemical principles. Core material is delivered through lectures and problem solving workshops supported by laboratory practicals and subsequent data analysis. This first year module is a core module for all Bioscience and Forensic Science programmes, and provides a firm foundation in general scientific and laboratory skills that students require to successfully complete their programmes of study. Students are introduced to the nature of studying in higher education, the need for effective time management and planning of work, the appropriate use of information sources, and to sources of information relating to careers in the biosciences. Scientific analytical and lab/practical skills are developed, together with essential mathematics and statistical skills for life scientists. A significant component of the module consists of the development of basic research skills such as practical skills in the laboratory, the principles of experimental design and the statistical analysis of data. 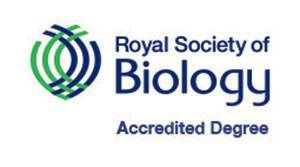 This is a non-credit-bearing module for students studying BSc (Hons) Biochemistry and BSc (Hons) Biological Sciences which must be passed in order to achieve a degree accredited by the Royal Society of Biology. It is designed to record satisfactory completion of a range of key practical laboratory skills and to provide a record of a student's achievement of competence in such skills. Students will receive a portfolio record of their competence at the end of the year to demonstrate their experience to future employers. This module is core in the Biochemistry, Biological Sciences (Human Biology, Medical Biology, Genetics and Molecular Biology routes) and Nutrition (Human Nutrition). It is also an option module for Biomedical Science. The module provides students with knowledge of the structure and methods of analysis of proteins, with particular emphasis on enzymes. This is followed by the study of the major catabolic and anabolic pathways and investigates how organisms obtain and use energy. These processes, and their regulation in health and disease, are considered at the molecular level, which involves many proteins including enzymes. The module builds on topics covered in LS4001 (Genes, Cells and Tissues) and explores more advanced concepts in cell and molecular biology. The module provides insight into the structure and function of cells, and takes an integrated approach to looking at how cells respond to changes in their environment - from receptor interactions and intracellular signalling pathways through to the regulation of gene expression and changes in cellular processes. Formal lectures are supported by laboratory classes, tutorials, workshops, independent study and further resources available on Canvas. The module also includes opportunities to develop both data-handling and written skills. This is a core module for students studying Biochemistry, Nutrition and Pharmacology. It aims to develop the scientific, academic and research skills that were introduced at level 4, and to relate applications of these skills to study and research in pharmacology. Research methods and employability skills are taught within the context of pharmacological research and associated industries. You will be introduced to the basic concepts of pharmacodynamics (how drugs take their effect at given targets) and drug disposition/pharmacokinetics (the effect the body has on administered drugs), whilst considering the factors which influence such parameters and thus lead to individual variability in drug response. The module goes on to discuss the principles of toxicology, how drugs are discovered and developed, and the role of pharmaceutical sector / regulatory bodies in this process. This is a non-credit-bearing module for students studying BSc (Hons) Biochemistry and BSc (Hons) Biological Sciences which must be passed in order to achieve a degree accredited by the Royal Society of Biology. It is designed to record satisfactory completion of a range of key practical skills and to provide a record of a student's achievement of competence in such skills. Students will receive a portfolio record of their competence at the end of the year to demonstrate their experience to future employers. This module is a core requirement for students taking Biochemistry, Biological Sciences (Environmental Biology; Medical Biology; Genetics and Molecular Biology), Medical Biochemistry, and Pharmacology. The main features of this module are to provide you with insights into the scientific basis of recent technological advances in biomolecular science through selected examples of contemporary scientific research and their impact on society. It will built on key knowledge consolidated at levels 5 and 6 to demonstrate the application of theory to current research, developments in bioindustry and the effect of advancements on society. The scientific areas selected are designed to stimulate topical debate and are blended as a series of lectures, seminars, tutorials and practicals. The interaction of science and the media, public engagement, and how these can guide scientific policy will also be discussed together with the challenges facing today's bioindustry including the role of intellectual property rights, bioethics and enterprise. Employability and enterprise are embedded to develop your scientific and professional skills. This module is a core requirement for students taking Biochemistry and Biological Sciences (Genetics & Molecular Biology route), and may be taken as an option by Forensic Biology and Pharmacology students. This module introduces you to the processes involved in maintaining genome stability, causing genome variability and controlling the coding potential of the genome. Mutation, recombination and transposition, and the interplay between them, are examined as causes of genome instability. The impact of genome instability/change upon gene expression, and its control, links these two main themes of the module. The module also introduces you to bioinformatics and sequence analysis. The use of sequence databases and analysis tools permits the analysis of gene/genome variability, along with the patterns of variability and conservation of sequences. This strand of the module gives an introduction to an area of increasing importance in many areas of bioscience research, including molecular diagnostics and drug development. Core factual material is provided via lectures, including demonstrations of the databases and analysis tools in the case of the bioinformatics elements, with additional resources being placed on Canvas. Over 50% of the teaching time in the module is spent on computer and laboratory practical work. This is a core module in the Biosciences field for a number of BSc (Honours) programmes. The project module forms a very important part of the degree programme and probably constitutes the largest piece of independent work a student is likely to undertake during his/her undergraduate studies. There are several types of projects that may be offered to students: a laboratory or field-based project, data projects involving acquisition of data and information from surveys, questionnaires, computer simulations or bioinformatics, or a systematic review of research literature that includes the collection, comparison and original presentation of reported research data. The end point is the same in all cases; review and critical evaluation of qualitative and quantitative information and data to address a hypothesis or research question, and the production of a written report. This is a core module for Pharmacology and an option for other Life Science degree courses, namely Biological Sciences (Medical Biology route) and Biochemistry. This module provides an opportunity to learn about the various chemotherapeutic agents used in the treatment of both infectious and neoplastic disease. Treatments for infectious diseases will cover drugs that have actions on bacteria, viruses, fungi and parasites, while the neoplastic disease therapy will include a range of different cancers, including both solid and blood cancers. The lectures will focus on the mode of action, side effects and mechanisms of resistance of both antimicrobials and anti-cancer drugs. This is a core module for Biomedical Science, and an option for Biochemistry, Biological Sciences (Medical Biology route), and Nutrition (Human Nutrition). The module evaluates the contribution of laboratory investigations to the diagnosis, treatment and prevention of disease in key areas such as renal disease, diabetes, anaemia, and haematological malignancies. The module also considers the role of the transfusion laboratory in the treatment of selected disorders. Topics are introduced through a structured lecture series and further explored in practical laboratory sessions. Additional material is provided via Canvas, with tutorials used to support the practical programme and strengthen understanding of key concepts. Throughout the module, case histories are used to illustrate current best practice in Clinical Chemistry and Haematology, and this is re-enforced by keynote lectures from expert practitioners in the field. The module also places an emphasis on students' acquisition of the knowledge and practical skills required by employers.